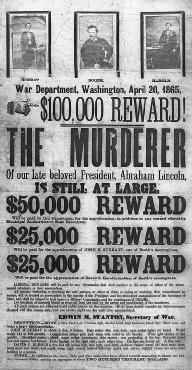 This 1865 poster offered a reward for three men (John H. Surratt, John Wilkes Booth, David E. Herold) alleged to have been involved in the assassination of President Abraham Lincoln. A sum of money or other compensation offered to the public in general, or to a class of persons, for the performance of a special service. It is commonplace for the police to offer a reward for information leading to the arrest and conviction of an offender or for a pet owner to post notices in a neighborhood offering a reward for the return of a lost dog or cat. In legal terms, the person promising a reward is offering to enter into a contract with the person who performs the requested action, that is, turning in a criminal or returning a lost pet. Performance will be rewarded with money or some other compensation. Therefore, the legal concepts involving rewards are derived from the law of contracts. An actual, valid offer must be made to create a contract of reward. The offer is merely a proposal or a conditional promise by the person offering the reward, known legally as the offerer. It is not a consummated contract until the requested action is performed. The person offering the reward can do so on any terms she wishes, and the terms must be met before the reward can be recovered. The subject matter of the offer can entail the discovery of information leading to the arrest and conviction of a person, the discovery of stolen property and the apprehension of the thief, the return of lost property, or the recovery or rescue of a person. A prize or premium can be a valid offer of a reward for exhibits, architectural plans, paintings, the best performance in a tournament, the suggestion of a name, or the achievement of the best time in a race. Any persons, including corporations, legally capable of making a contract can bind themselves by an offer of reward. Legislatures have the power to offer rewards for acts that will be of public benefit. Legislatures, however, typically empower officers, such as the governor, the U.S. attorney general, or a federal marshal, to offer rewards for certain purposes, such as the apprehension of criminals. Unless a statute requires the offer to be in writing, the offer of reward can be made orally. An offer can be made by a private contract with a particular person or by an advertisement or public statement on television or radio, or in a newspaper, handbill, or circular. A contract of reward, like any contract, must be supported by consideration, something of value. The consideration that supports the promise of reward is the trouble or inconvenience resulting to the person who has acted on the faith of the promise.Because an unaccepted offer of reward grants no contractual rights, the offer can be revoked or canceled at any time prior to its acceptance by performance. Once a person has performed or partially performed the requested action, an offer of reward cannot be revoked to deprive a person of compensation. An offer must be revoked either in the way in which it was made or in a manner that gives the revocation the same publicity as the offer. A later offer, in different terms from the first, does not revoke the first offer. Generally an offer of reward that has no time limit is considered to have been withdrawn after a reasonable time. What constitutes a reasonable period of time depends largely on the circumstances under which the offer was made. In some jurisdictions a reward for the discovery of criminal offenders only lapses when the Statute of Limitations has expired against the crime. A reward can be claimed only by a person who has complied with the conditions of the offer before it expires or is revoked. Performance can be completed by a third person, such as an agent or servant, who is acting on behalf of the claimant's interest. When the reward is offered for information leading to an arrest and conviction, the return of property, the location of a missing person, or for other purposes, the person who furnishes the information is entitled to the reward. This rule applies even if, in the case of arrest, the person does nothing more than disclose the information and others make the physical capture. The informant need not become involved in the prosecution or appear as a witness at the offender's trial to collect the reward. The information must be adequate and timely for a person to collect a reward. If a criminal has surrendered or the information was already known when the informant provided it, no reward will be given. Likewise, if the information does not lead to the desired end included in the initial offer, such as an arrest and conviction, or the recovery of property, the reward will be denied. However, when the reward is for the detection or discovery of an offender, a conviction is not necessary as long as the discovery or arrest occurs. Rewards have ended countless criminal careers. On occasion, the lure of money has even been enough to entice criminals to turn in their associates. Such was the downfall of the famous nineteenth-century outlaw Jesse James (1847–1882). After the U.S. Civil War, James quickly became one of the most notorious bandits on the U.S. frontier. With his older brother Frank, Jesse led the so-called James Gang through several robberies and murders during the 1860s and 1870s. Their daring holdups of banks, stage coaches, and trains made them figures of romantic myth for readers and prime targets for law enforcement posses, which they long managed to evade. A reward brought James to his end. Having barely escaped with his life after a thwarted bank Robbery in Northfield, Minnesota, in 1876 that left two of his gang dead, James hired new outlaws and lived under an alias in Missouri. In 1881 Thomas T. Crittenden, the state's governor, offered a reward of $10,000 for James's capture—dead or alive. One of the new gang members, Robert Ford, contacted the governor, then bided his time. On April 3, 1882, Ford saw his chance in James's house. When the gunslinger laid down his pistols and climbed on a chair to adjust a picture frame, Ford shot him in the head and instantly killed him. What the law had been unable to do, one of the lawless accomplished. When a reward is offered for the apprehension or arrest of a criminal, a personal arrest by the claimant is usually not necessary. The arrest of the wanted person must be lawful, no matter who makes it. Those making an unlawful arrest cannot recover the reward because an agreement for an unlawful arrest is against public policy and unenforceable. If the offender voluntarily surrenders or is en route to surrender, the captors have not earned the reward. Generally when a reward is offered for the arrest and conviction of an offender, the person claiming the reward must have caused both the arrest and subsequent conviction because both are conditions of recovery under the contract. The reward in such a case cannot be apportioned between what is due for the arrest and what is due for the conviction. When lost property is involved, some states have statutes that provide for a reward for the finder or for compensation for the expense of recovering and preserving the property. If only a proportionate share is returned, the finder is entitled to a proportionate part of the reward. When such a statute does not exist, however, a finder has no right to a reward for the return of property to its owner if none has been offered. If the offered reward is definite and certain, the finder has a lien on the property in the amount of the reward until it is paid. A lien is a charge against property to secure the payment of a debt or the performance of an obligation. For example, if John offers a reward of $100 for the return of his missing motorcycle and Bob goes looking and finds it, Bob can file a lien for $100 against the motorcycle with the local court if John does not pay him the reward. If the offer is indefinite, such as one that states "liberal reward" for the return of the motorcycle, there is no lien on the property. Except in the case of statutory rewards, the general rule is that the person who claims the reward must have performed the services knowing of the offer and for the purpose of collecting the reward. For example, if Bob happens to find John's motorcycle in a ditch and returns it to John not knowing that he had offered a $100 reward, Bob cannot claim the $100. This rule is based on the theory that without such knowledge there can be no meeting of the minds, which is essential to the formation of a contract. Knowledge of a statutory remedy is not necessary to entitle the claimant to recover it. When a reward is offered to the public, anyone who performs the required service can claim and accept the reward, except persons who are under a duty to perform such services. A law enforcement officer, therefore, cannot claim a reward if the service performed is within the line and scope of the officer's duty. This prohibition will apply even if the officer performed the service at a time when he was not on duty or was outside his territorial jurisdiction. When, however, an officer acts beyond the scope and line of duty, there is no prohibition in claiming the reward. A person who aids and abets the commission of a crime has no right to a reward for the arrest of the perpetrator. Similarly a person who purchases stolen property with reasonable grounds for believing it has been stolen cannot receive a reward offered for its return. Contracts; Finding Lost Goods; Offer; Meeting of Minds; Prize Law. InterContinental Hotels Group (IHG) has launched IHG Business Rewards, offering rewards on all qualified business bookings for guest rooms, meetings and events. Conversion rates between Rapid Rewards and A+ Rewards include; 1,200 Rapid Rewards Points for one A+ Rewards Credit; one Rapid Rewards Credit for one A+ Rewards Credit; one Rapid Rewards Standard Award for 16 A+ Rewards Credits; one Rapid Rewards Freedom Award for 32 A+ Rewards Credits. Etisalat is the first telecom operator in the world to reward its customers through an online reward shop option," said Khalifa Al Shamsi, senior vice president of marketing, Etisalat. Treasury Inspector General for Tax Administration, The Informant's Rewards Program Needs More Centralized Management Oversight (June 2006). What if you don't have the budget or the infrastructure for a rewards program? Second, as noted earlier, the reward system for one individual on the senior team cannot conflict with the reward system of either the larger team or other individuals on the team. Reward contingencies that enhance perceived competence or self efficacy are expected to increase interest, motivation and performance. Although information provided by a tipster has resulted in convictions in just 6 percent of the cases in which a reward was offered, detectives and city officials say the money often is their last hope in solving a case that has gone cold. Leadership needs to constantly reinforce that evolution of the criteria and rewards is not "changing the plan. Moreover, the systems that private companies use to measure and reward productivity are far from flawless. If participants in the reward condition spend less free time on the activity, perform at a lower level, or express less task interest than those in the nonrewarded group, reward is said to undermine intrinsic motivation.